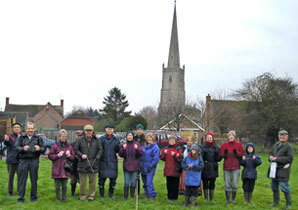 in Gloucestershire was formed by Peter Golding in 2003 in response to requests following a talk given to the Local History Society on the discovery, by dowsing, of an ancient labyrinth in the village. The formal Inaugural Meeting was held on 23 November 2006. The ancient skill of Water Divining; how to locate unseen underground archaeological features; how to diagnose and relieve health problems in people and animals. We welcome enthusiasts and beginners from throughout the county and beyond at our fortnightly practical sessions. Almost anyone and everyone can dowse. We offer training and coaching after our Saturday meetings, or come along on the field trips and have fun learning on the job. We meet on the second Saturday morning of the month. We take a pride in the quality of our speakers at our meetings, who cover a variety of subjects including history, archaeology, leys and energy lines, health, water divining - you name it. 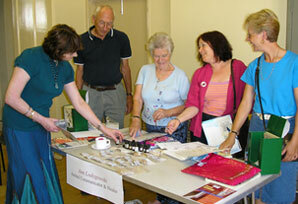 A few of our members are also available to give talks to other groups on occasions. Please enquire. Second Saturday of the month: 9:45am for 10:30am. Please check our events by selecting 'Events' from the menu. Note, some Saturdays we go on field trips. In addition to our usual meetings, we have two other sections - the Archaeological Section which meets quarterly and enjoys a variety of field trips to interesting sites, and the Health & Wellbeing Section which meets once a month, after our usual Thursday meetings. We hold a wide selection of books which are free to borrow. Just sign the book of your choice in and out, with a date, on the relevant form, filed under book title in the pink folder. To see our full library select Library on the menu or to view a downloadable excel file click HERE for the list of books available.